I’m a big fan of Ted Talks. I have the app and love to immerse myself in inspiring presentations. One that recently caught my eye was ‘How to get empowered not overpowered by AI’ by physicist Mark Tegmark from the Massachusetts Institute of Technology. (Take a look at the video, here.) Listening to it, I found myself wholeheartedly agreeing with his argument that artificial intelligence has the potential to be the best – rather than the worst – thing to happen to humanity. Applications for AI are far-reaching and potentially transformative. While it may not be a magic bullet that will solve every challenge currently facing the retail industry, this technology gives brands a greatly enhanced ability to create deeper emotional connections with their online customers – increasing loyalty, creating a competitive edge and boosting revenue. Shopping has transformed from a compartmentalised activity into an omnipresent experience, available anywhere, at any time. As the number of potential consumer touchpoints with any brand grows, so does the amount of data available. AI is key to unlocking the real value from this vast mountain of information, via algorithms that process data in a smart and fast way to provide crucial insights about consumers. Retailers want to promote and sell what they have and tune that in with what the shopper is looking for – going beyond personalising the journey to making it relevant. That’s not easy without a helping hand from this technology. By tracking data on visitors’ behaviour using AI-driven algorithms, it’s possible to glean valuable information. What time of day did they visit? What device did they use? What did they look at? Once they found a product they liked the look of, where do they go from there? With this knowledge, retailers can make appropriate suggestions to encourage further exploration that may lead to a purchase. The algorithms rely on both human and machine learning to function. They need the input of skilled merchandisers to train them initially using rule-defining tools that teach the required decision-making system. Once integrated on the retailer’s e-commerce platform, the process can be automated to enable algorithms to make the same complex decisions a human could, but much faster and at volume. For example, algorithms can analyse onsite search terms and popular keywords on social media and Google, providing retailers with the insights required to structure and present content appropriately. Similarly, they can process catalogue images to offer visual recommendations or suggest alternatives based on other shoppers’ preferences to tailor each individual customer journey. 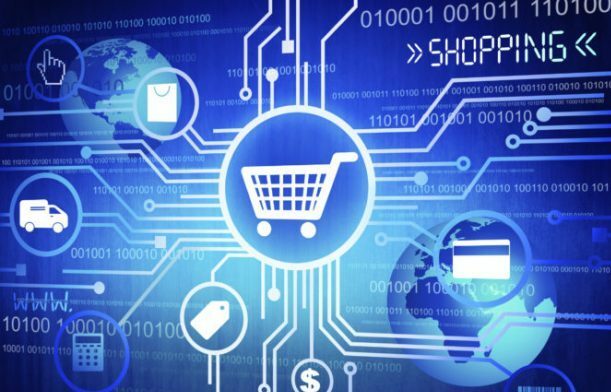 These enhanced, personalised and targeted merchandising techniques that can serve up relevant results in less than a second would be impossible without AI logic driving them. In addition, retailers need to see how successful their merchandising strategies are in terms of return on investment. AI enables insights to be extracted from this sea of data through the use of reporting tools. Beyond these universal applications, retailers are finding ways to tailor data to their specific requirements. For instance, as a marketplace, eBay has the challenge of battling fraud. While data for most retailers is curated by internal experts, eBay and other marketplaces rely on sellers to provide accurate information. Sellers have an incentive to include more information than necessary in order to trick search algorithms and make their products appear more prominently in listings, which of course is not in eBay’s interest. Consequently, eBay relies on data such as trust scores and search algorithms that are resistant to keyword spamming – identifying which listings and sellers could lead to a poor experience for shoppers. AI also allows retailers to try out ideas without impacting revenue. The German ecommerce brand OTTO does this well. Operating in more than 20 countries, it drills into its data to test new strategies offline to perfect onsite search terms. OTTO uses its pool of data on relevance judgments or ‘right answers’ that rate whether a product is relevant to a specific search term and behavioural data to determine if a result is appropriate in the current context. For example, if a shopper searches for ‘Belgian chocolates’ should the retailer show chocolate made in Belgium or the variety of chocolate known as ‘Belgian chocolates’? OTTO uses this set of product relevance scores to compare how different settings would affect the total relevance of all results. While AI has practical everyday applications and can be adapted quickly in response to requirements, a successful merchandising strategy is still as much an art as a science. A human touch may be necessary for a page needs to look aesthetically attractive and remain true to the brand’s identity. This is a challenge facing luxury retailers in particular, which want to mirror their luxurious in-store environment online while encouraging customers to explore the site in more depth and maximise revenue. 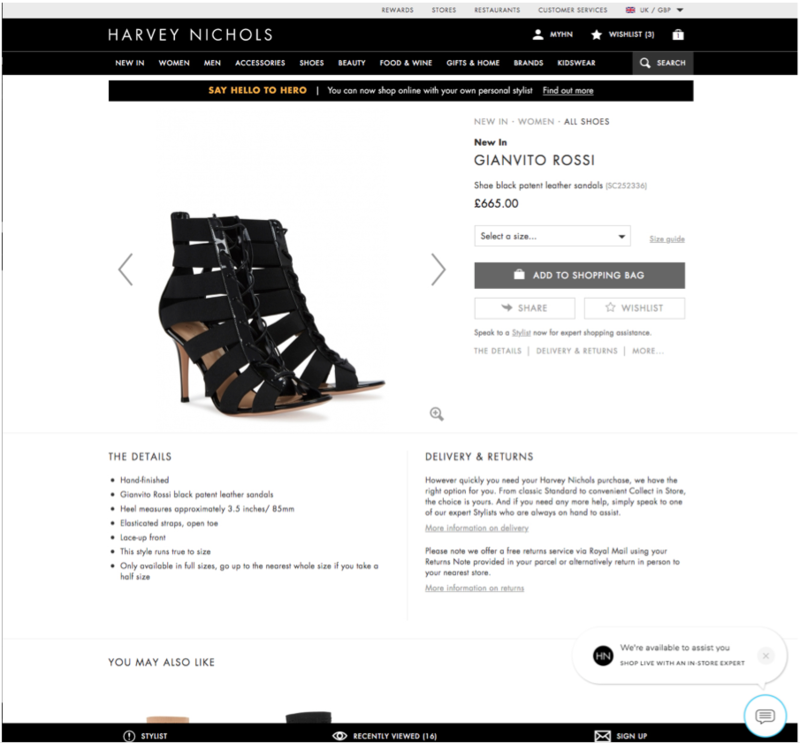 Harvey Nichols is a good example of best practice in this field. The retailer has been able to find a balance by combining automation with manual curation. It uses advanced automated processes to supply all information required to arrange and present category pages, making it easier to search and navigate the website. 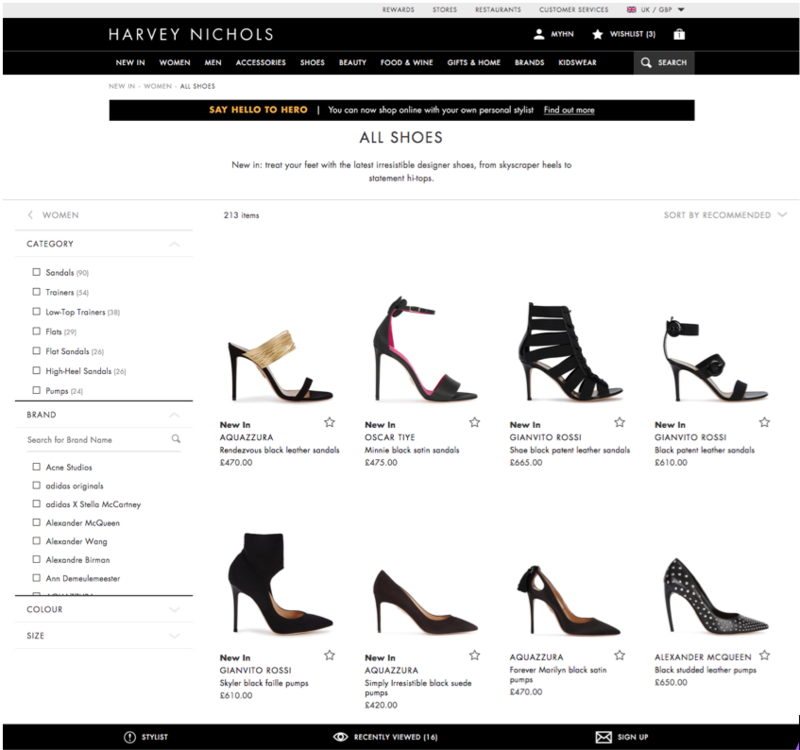 Meanwhile, responsive merchandising tools allow Harvey Nichols to manually curate individual category pages on a granular level. This ensures products shown to the customer can be prioritised according to brand and business requirements such as trends or campaigns. Retailers are constantly innovating in this space. Fashion brand Zalando has a well-funded research team that is constantly developing new techniques. The brand is trialling a fully deep learning-based product search without any configuration of search settings from merchandisers to influence the results. It is entirely data-driven, with user behaviour, product catalogue and product imagery as the main input. The prototype showed some interesting properties such as error tolerance and alternative results that are visually similar. While this is arguably an extreme approach, it demonstrates areas that deep learning is good at – such as visual aspects and spell-checking – and, also, some it is not yet equipped to deal with, such as situations where there isn’t enough data. When used well, there’s nothing nefarious about AI and it can help both customer and retailer. Consumers may not be fully aware of the impact of AI in their shopping activities, but they will unwittingly appreciate the results. As Mark Tegmark said in his Ted Talk, AI has the potential to help life flourish like never before and accomplish complex goals. What we have to remember is it’s not enough to make technology powerful, we need to decide how to steer it and make it work for us. Retail is entering an age of enlightenment. Please share your thoughts about this article – the GMA is a community of data-driven marketers and we value your opinion. Click back to our HOME PAGE to view all the latest insightful posts from our expert contributors. Peter Thomas has more than 30 years' experience in the software technology sector, including over a decade delivering scalable online software and services. He joined Fredhopper in 2016 as CTO. Following online merchandising specialist ATTRAQT’s acquisition of Fredhopper in March 2017, he became CTO of the combined group, where his main responsibilities include product development and client delivery services. 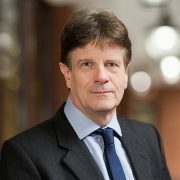 Peter Thomas has a wealth of experience in business across public and private companies. Previously he was CTO of the cloud division for IRIS Software and director of development at Betfair across UK, Romania and Portugal.